Image caption Sony's PlayStation Classic is 45% smaller than the original. 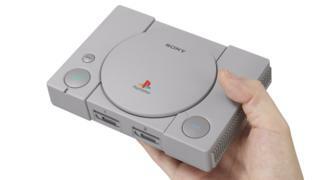 Sony has announced a miniature version of the first PlayStation console, which originally launched in 1994. The console is the first of Sony's video game machines to be given this kind of compact makeover. Nintendo has previously made mini versions of its NES and SNES consoles, which also included a set of pre-loaded classic games. Among other titles to be featured on Sony's new system are Ridge Racer Type 4, the role-playing game Wild Arms and first-person platformer Jumping Flash. The device will retail for £89.99. As well as the mini console, an HDMI cable for connecting to a TV and two wired controllers will be included. The design of the console is faithful to the original - even featuring a disk eject button, despite the lack of an actual disk reader. Instead, pressing the button will swap the game being played for another. "It changed everything," said games journalist Chella Ramanan about the original PlayStation. "It became part of 'lad culture', for better or worse. It became part of youth culture. "It was the first console I owned. Sony did an incredible marketing campaign, tapping into club culture to make games cool. It became a lifestyle thing for people in their 20s." Ms Ramanan argued the retro consoles created by Nintendo and Sony appeal to the nostalgia that people have for the 1980s and 1990s, from pop music to TV shows like Stranger Things: "They have the aesthetic people want from older technology. There's something charming in the huge, clunky buttons." Also, retro systems offer a way for a new generation to play a 'canon' of iconic games, said Ms Ramanan: "The industry is getting older so we do need to find a way to keep an archive of our history."